Newcastle hosted its first Kidical Mass on 1 July this year. 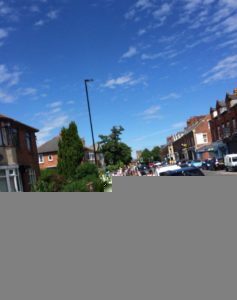 Organised by parents of children from St Teresa’s and West Jesmond primary schools, the event attracted families from all over the city. 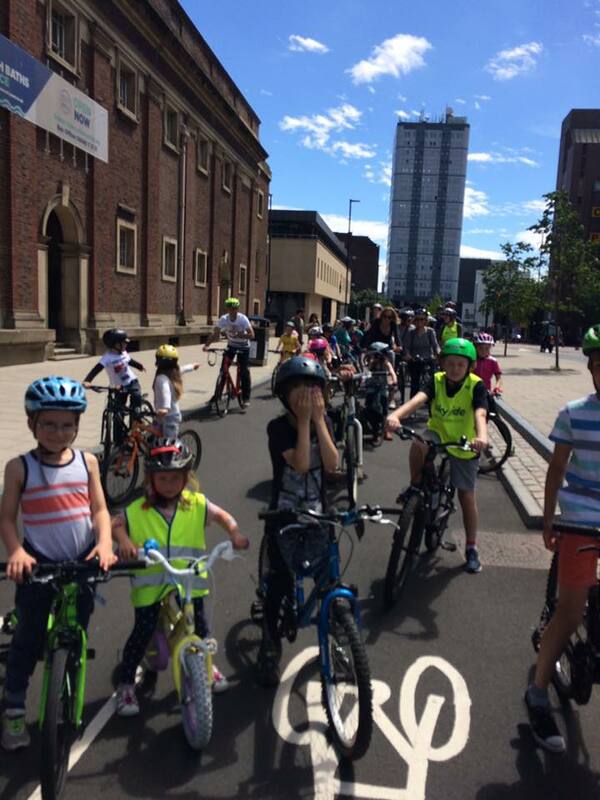 Newcycling supported the event and it reinforced the importance of getting councillors to sign up to creating a #city4kids in Newcastle. This will be our focus in the run up to next year’s election. Over a hundred adults and children took to the streets in Heaton and Jesmond to cycle into the city centre on some of our new cycle paths. 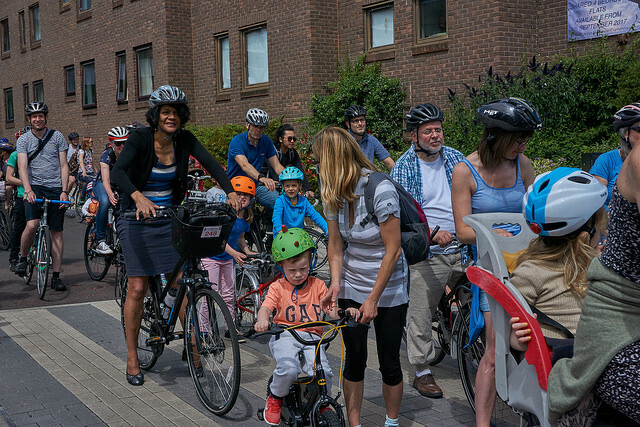 We had babies on bike seats and in cargo bikes, young children on tandems and tag-alongs and, of course, lots of older children on their own bikes and balance bikes. It was fantastic to see so many families enjoying themselves and we were very lucky that we had a lovely sunny day. One ride started at St Teresa’s Church on Heaton Road and the other at Jesmond Library. Most of the rides were on quiet streets and separated cycle paths and we only had one or two impatient drivers to contend with. Amazingly, we all arrived at the Civic Centre at roughly the same time. Awaiting us there were councillors from Jesmond, Ouseburn and Fenham and Newcastle Central’s MP Chi Onwurah. They joined us for the last leg of our journey down the new John Dobson Street cycle path to the blue carpet and The Journey cafe where Newcastle Council staff had very kindly arranged cake for everyone. Kids enjoying new cycle lane on Heaton Road. Photo credit: Claire Prospert. 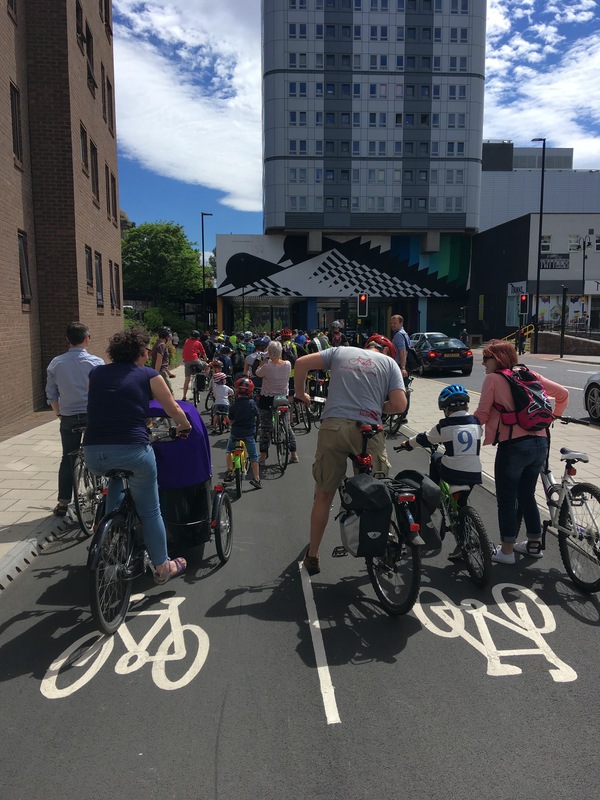 One highlight of the day for me was hearing one 4 year old describe it as ‘the best day of his life so far’ because he was allowed to cycle on the road – something not usually possible because of the traffic. Another was watching a group of 6-10 year olds leading the way down John Dobson Street cycle lane by themselves on the way home and pausing at the traffic lights for a chat while they waited for the light to change. 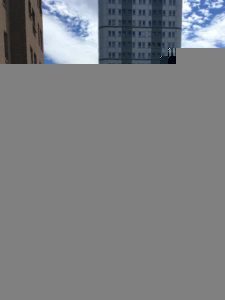 It proved how this kind of facility can transform a child’s experience of the city. 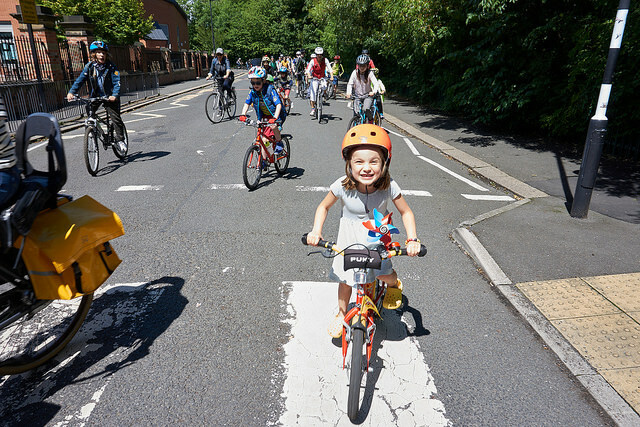 The Kidical Mass message is ‘kids are traffic too’ and the day certainly showed what was possible with the right kind of infrastructure. The problem is that kids currently don’t often have the opportunity to be independently mobile because it isn’t safe for them to mix with other traffic. Wouldn’t it be great if our politicians and planners started to include children in their transport plans? 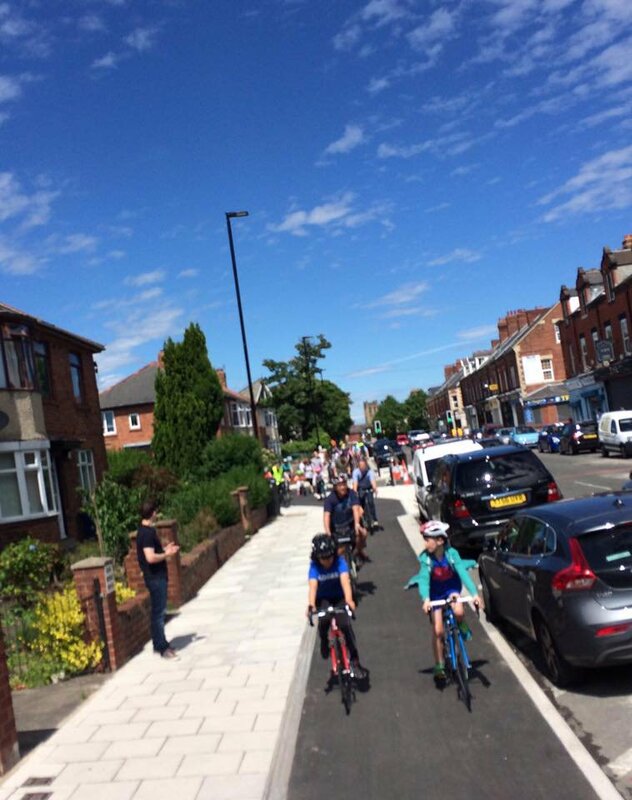 Our message to the council is that we want more of our streets to look like Heaton Road and John Dobson Street so that our kids can cycle too. Watch this space for a Christmas Kidical Mass. More details coming soon.